Nintendo will launch a black Balance Board and Wii Fit Plus in the UK and Ireland next month. This isn't the first time the board has been available in black: it was released with the black Wii console in December 2010, but it is the first time it's been available separately. No word on pricing — as always, retailers set the final price — but expect it to come in around the £70 mark. 26th September 2011 – If you are searching for a fun way to work out while at home this autumn, or know someone who is looking to tone up ahead of Christmas, then look no further. Nintendo is launching the black Wii Fit™ Plus software bundle on 7th October 2011, the perfect gift for fitness fanatics this Christmas. The bundle includes a copy of Wii Fit Plus and a black Wii Balance Board. Wii Fit Plus is a workout for both body and mind from the comfort of your own living room. Packed with over 60 activities including 15 balance games and six strength training and yoga based activities, you can work out, relax and ease away the stresses of daily life. You can also customise your fitness routines to make your at-home training regime even easier and there’s even a calorie counter which makes reaching your targets more measureable. The pressure-sensitive Wii Balance Board can read your real-life movements and bring them to life on screen, just like the Wii Remote™ controller. The board has built-in sensors measuring weight and detecting shifts in balance, both from side to side and front to back. It can be used for an extensive array of fun and dynamic exercises activities, including aerobics, yoga, muscle stretches and games. After a hearty workout, why not have a little fun as you cool down and try your hand at snowboarding down a mountain or carefully walking a tight rope? 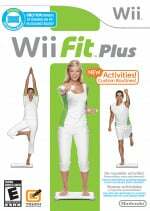 The new Wii Fit Plus software bundle launches in UK and Ireland on 7th October 2011 and includes the black Wii Balance Board and a copy of Wii Fit Plus. Why? Nintendo is just trying to juice us out. Join the Dark Side of the Wii Fit ! They're doing it because the white one would get stained yellow by everyone's filthy feet. You can't just get a black silicon cover for the white ones? Put it where the sun irradiates and you'll have a nice footwarmer. For folks in UK with feet like this..
Hardy83 milking a pun out of everything Nintendo does? NEVER! The new Balance Board is obviously covered with a stealth paint, to hide the fact of re-releasing the same product again. But seriously - I think it's always better to get a black Balance Board for a black Wii, for the sake of... uh... design coherence? If they are going to come out with a black board shouldn't it come with Wii Plus 2 and work with 2 boards at the same time so people with the white board can jog/bike/fly/balance/juggle around the island together? (Yes I know the island is from Wii Sports Resort but Wii Fit Plus - not the first - seemed very similar) And add online so people can compete and compare scores on all the minigames? I guess Wii Fit Plus U will work with 2 boards and have online then. While Nintendo don't milk things as much as Hardy83 is implying they are milking this. 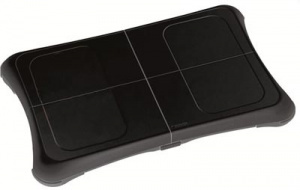 Why not just release the black balance board seperately rather re-release Wii fit plus to sell it. @armoredghor Surprise, I'm making a pun at Nintendo on..a Nintendo site. GASP! If this were a Square-Enix site, I could probably say the same thing, which I can actually.